Yama is the much dreaded god of death. Depicted as a man with a gruesome face with dark green skin, coppery eyes, and blood-red robes, he resides in his palace in Naraka situated in the nether regions. Yama rides his buffalo when entering the human realm carrying his mace and noose, dandahasta and pasahasta, everywhere in case he needs to cut off an individual in the midst of his or her life. Recorded in the Book of Destiny, every living soul’s life span has been predetermined. Assistants to the god are responsible for fulfilling the duties of the book and bringing down the souls to Naraka. With Yama sitting on his throne, Chitragupta, one of Yama’s better known servants, will read out the sum of the deceased man or woman’s assets and sins as they pass judgement before the god. Accordingly the hardened sinner will be sent to one of Yama’s many Hells, or virtuous individuals will be reconciled with his or her forefathers in Pitris (Pitris is an equivalent to heaven). In some cases, it is told that an individual may also be reincarnated (rebirthed) back to the world either as a superior or inferior organism; depending on their Karma. As stated by Dieter B. Kapp in his article The Concept of Yama in the Religion of a South Indian Tribe, “Life on earth is characterized by deeds performed according to one’s own will and wishes, though they are predestined. Life after death, i.e., life which starts with death and ends with the reaching of paradise, means purification from worldly sins. The span of life which has to be spent lying on the ‘refuse heap’ of the region of ancestors serves for purification from pollution sins. Life in paradise is marked by external bliss, it., eternal youth, love, abundance of vegetarian food, music and dance” (Kapp, 518). Despite Yama’s later evil role in Hindu mythology, the Vedas described Yama as the first man who died and the king of the departed. Vedic tradition also references Yama as the lord of justice, giving him the title Dharma. Yama can be interpreted to mean “twin” in Vedic tradition some myths have him paired up with his twin sister Yami. Surya, the sun god is also the father to Yama, his brother Shani and sister Yami. 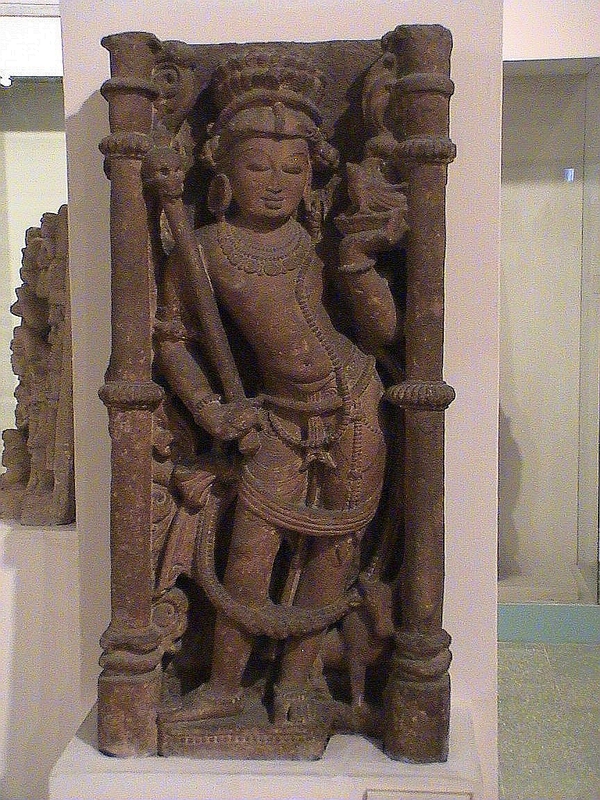 Yami has a minor role in the rg Veda, but fascinatingly Shani is portrayed as the deity that gives the sentence of one’s deeds throughout life by appropriate punishment and rewards; Yama grants the outcomes of the actions after death. Relating back to death, Yama is given another name: Kala, Sanskrit for “time”, appropriately assigned because time is naturally selected and nobody can stop or change time. To better explain, human health always nears death after birth through decay, disease, or accident. The only cause of delay of being taken to Naraka is due to treatment options of sick persons, but the inevitability of death can never be stopped due to the outline of nature. In terms of classification systems of Hindu mythology, Bodewitz best describes it in his article The Dark and Deep Underworld in the Vedas. “In the classificatory system (see Bodewitz 2001) the east belongs to the gods, the southeast to (some of) the Pitrs, the south to (some of) the Pitrs, and the southwest to the demons (at least it represents hell). Here the south (the region of some of the Pitrs) is in opposition to the north (the region of people living on earth). Again this opposition has to do with light (north) and darkness (south). It also deals with above and be- low, since the north (uttard) and the south (adhard) are qualified by adjectives in this sphere.” (Bodewitz 221). To better explain, Hindus view the southern region as inauspicious because of Lord Yama’s ruling. East and North having to be associated with light are considered auspicious. In addition to Hindu mythology, Yama is included in Buddhist teachings. Though in Buddhism, Yama loses his role as a judge and punisher of the underworld because Buddhist teachings state that Karma alone will determine an individual’s fate come time for death. Logically, because of karma there is no need for a supernatural justice, restating the lack of Yama’s role. Come death the souls of the dead are reminded by Yama the concept of Karma and that the souls are responsible for the punishment they will undergo. Buddhist teachings also surround Yama by a concept of Mara which speculates Yama is hidden in the embodiment of moral evil. Contrasting from the Hindu’s depiction of Yama: dark green skin, gruesome face with copper eyes, and blood red robes, tantric Buddhism shows Yama as a terrifying figure ornamented with human skulls, consumed by flames, and holding in his right hand prajna (sword of insight), and in his left hand the mirror of karma, so the individual looking into the mirror shows the true reflection of their deeds. Japanese Buddhism worships Emma (same role as Yama), the demon lord of the Underworld who judges the dead. Emma (Yama) can only be overruled by prayers. In addition to his rule as king and judge of the underworld, Yama is also a great teacher. “This is one of the ten principal Upanishads, which are expansions to the four Vedas that are usually delivered” as explained in Laura Strong’s written works, Immortal India: Mythic Hindu Death Rituals and Beliefs about the Afterlife. Despite the obvious meaning of the Upanishad (death, and the meaning surrounding it), it also elucidates the meaning of life and secret to immortality. To summarize the Katha Upanishad surrounding Yama and his teachings, the myth starts with a character Nachiketa. Nachiketa had a pure soul, despite being the son of a notoriously greedy man. Feeling disturbed by viewing his father inappropriately sacrificing cows, the boy asks his father to whom was he given. Despite being ignored Nachiketa asked again, and on the third time the irritated man banished Nachiketa to Yama’s abode. Upon discovery of Yama’s absence, loyal Nachiketa waited three days and nights. Upon Yama’s return, the might god offered him three wishes. Firstly, Nachiketa wished to be returned alive to his father and have his father be pleased with him. Secondly, Nachiketa wished to be instructed on how to perform a proper Vedic fire-sacrifice. “The third and most important boon requested by the young student is to know the secret of immortality. Yama is not as eager to hand over this knowledge, but eventually Nachiketa persuades him and he begins by teaching Nachiketa “the mystic sound which all scriptures praise–Om.”” (Strong 2000:6). He then goes on to explain that, “When the body dies, the Self (Atman) does not die!” (Strong 2000:6). Accordingly, one must fully understand Atman. Upon writing about Yama, it is logical to provide information about Hindu death rituals. Following the passing of a family member, relatives of deceased individual start preparing for either cremation or having the body placed in a burial ground. Typically, unless the family is dealing with an infant, the body is cremated in which the cremation pyre is lit by the eldest son. Subsequently the ashes are then submerged into a holy river, following the family undergoes a purifying bath to enter a state of extreme pollution. Pinda (rice balls) are then offered to the spirit of the deceased during the memorial service. Particularly, this is viewed as a contribution to cleanse the soul so it can pass through the realm of Yama. In conclusion, Yama is guardian of the South presiding over the resting place of the dead and the lord of death Yama is relatively a substantial part of mythology in India. Earlier represented by the Vedas as a cheerful king of the departed ancestors who became the first human to die, this god’s role quickly changed in later mythology to become a judge of good and evil deeds of deceased souls and determine their retribution. Beyond Hindu mythology Yama has passed over into Buddhist mythology with a lesser but similar role as guardian of the dead in the following countries: Tibet, China, and Japan. Reflecting on the recently deceased individual’s karmic balance, Yama makes judgement and governs a proper reprisal. Upon deciding, Yama safeguards proper rhythm in considering rebirths back to the Hindu world so the Hindus make daily offerings of water back to this god. Rodrigues (2006) “Hinduism The eBook an Online Introduction” Journal of Buddhist Ethics Online Books, Ltd.
Roy, Christian (2005) “Traditional Festivals a multicultural encyclopedia” Library of Congress Cataloging-in-Publication Data.